You are looking at a unique, one off, bespoke Land Rover Defender 90 300 Tdi County station wagon, first registered in April 1996. It can only be described as stunning. It has been professionally refurbished at a total cost of £20k!! I can describe it to you but believe me, it needs to be seen and driven to be fully appreciated. Boyds purchased this Defender and it was a very nice sound low mileage Defender 90 County station wagon. It went into their workshop and was totally stripped and refurbished into this absolute stunner. It is finished in metallic Rolex Rose Gold with black top, bonnet and trims, full bespoke matching premium leather interior with cross stitching. It has been Dymo sound deadened throughout and fitted with a premium head lining and luxury thick pile black carpets. The £1,000 premium sound system incorporates sat nav, dvd player and off course Bluetooth. The steering wheel was replaced with a smaller Momo wheel. 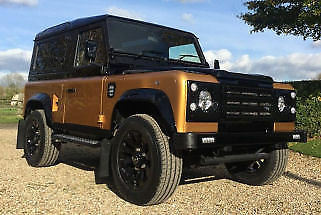 Externally it has been fitted with KBX headlamp surrounds, grill and vents, black chequerplate kit, side bars, 18" Sawtooth alloy wheels with a brand new set of tyres, LED lighting, daytime running lights, privacy glass to rear etc etc. 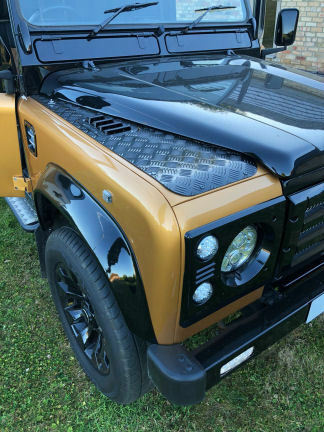 If you are looking for a stunning bespoke Defender that will last you forever, you've just found it! If you have any questions whatsoever, please feel free to phone me on 01204 465235 anytime up until around 10.00 in the evening. The Land Rover is situated in Bolton, near Manchester and any inspection is invited. Delivery or collection from Bolton train station can easily be arranged if required.